A Q and A with volunteer Ahmed Shah. 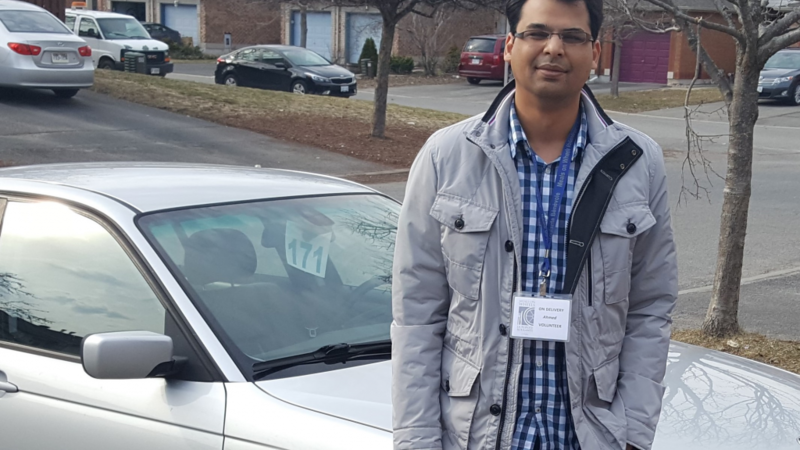 Meals on Wheels Coordinator of Volunteers Jena Davarajah had an opportunity to speak with Ahmed and hear his thoughts about his volunteer work delivering meals to seniors and adults with disabilities in Ottawa. Here’s a little bit about what he had to say. A: I am currently a master’s student at Carleton University and I’m also working in Research & Development for a tech company. I was born in South America Guyana, moved to Barbados and then to Ontario, Canada. From my earliest memories of living in Barbados my mother spent a lot of time doing volunteer work with disabled children. She continues to do volunteer work in Guelph to this day. Part of her spirit for helping others in need in the community has made its way to me. I find MOW is a wonderful and effective way for young professionals and students to contribute to the community. Q: How did you hear about Meals on Wheels Ottawa? A: I was working for a tech company in Ottawa and I became interested in finding a volunteer opportunity during the weekends or that I could fit in during the weekdays. There are many reasons why I chose to volunteer with MOW. Many years ago, a colleague who I worked with in Markham told me about his positive experiences doing Meals on Wheels in the GTA. Also, out of the many volunteer opportunities in Ottawa, Meals on Wheels stood out for its convenient time commitments of being able to volunteer during my lunch breaks, as well it’s quick response time for on-boarding. Q: How do you juggle volunteering with Meals on Wheels as a student or as someone working full-time? A: The hours are convenient since they are during the lunch hour and there are opportunities to work on Saturdays. Also, the tasks are quite simple. If I’m a driver all I need to do is follow my GPS to each destination and if I’m a server I just deliver the right meal to the right client and check if the client is doing well. Q: Why do you continue to volunteer with Meals on Wheels? A: The clients are always thankful and outspokenly appreciative of what we do for them! Q: What have you personally gained from being a volunteer with MOW? A: MOW is a great way to meet people from all walks of life and hear their incredible life stories. Some of the MOW volunteers have overcome many personal obstacles of their own and still provide time to help others which is highly encouraging. Many have interesting hobbies, have traveled the world, and share common interests that I have. Although I’m not a native to Ottawa, some volunteers have seen our city grow and change decade after decade and it is always great to hear their stories. I also get to see many different areas of Ottawa that I wouldn’t normally venture into! Q: What would you say to someone who is thinking of volunteering at Meals on Wheels? A: I would encourage anyone who has been thinking about volunteering to volunteer with Meals on Wheels. On-boarding is fast and it’s a great way to contribute to the community.